Regardless of gender or sector, employment rates among those with less education are considerably lower than among the well-educated – while gaps in their employment rates are much greater as well. The strong relationship between education and employment has been found across developed countries. More educated workers are more likely to be employed and enjoy higher incomes. This relationship between education, employment and incomes, which is primarily due to structural changes inherent in the economic growth process, has strengthened in recent decades. As economies develop, the need – or the demand, as economists refer to it – for educated, skilled workers increases while the demand for uneducated and unskilled workers falls in relative terms. This education-employment link is strong in Israel as well – and it crosses gender and sectoral lines. In his article on Israel’s labor market in the latest State of the Nation Report, Taub Center Executive Director, Dan Ben David, found that more education is related not only to higher employment rates, it is also related to much smaller employment gaps between Jewish and Arab women and men. The first figure focuses on employment rates for Israelis with relatively little education, those with no more than 11 years of schooling. It shows that Arab women with little education also have extremely low rates of employment – no more than 10 percent for any age group. Jewish women with low levels of education have higher rates of employment, though these barely rise above 60 percent at their peak. 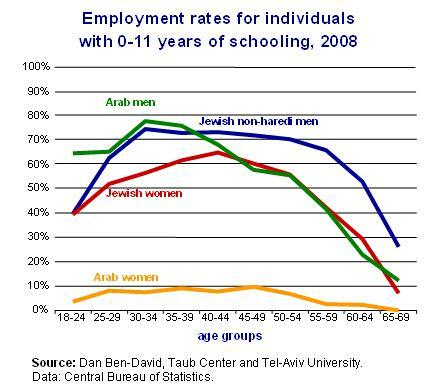 While young Arab men with little education have employment rates similar to those of their Jewish peers, the rate falls rapidly with advancing age, and by the early sixties their rate of employment is only about half of that for non-haredi (ultra-Orthodox) Jewish men. The employment situation for Jewish and Arab women and men with academic degrees differs considerably. The second graph highlights two important findings. Among those with academic degrees, the overall rate of employment is much higher for all groups. Having an academic education is associated with higher employment rates at all ages and for all groups. The graph also shows that the gaps between groups are considerably smaller for academics. The overall gap between employment rates for non-haredi Jewish men versus middle-aged Arab women is over 60 percentage points, while for academics in the same age group the difference is on average less than 15 percent. It is important to note that these graphs show only employment rates indicating whether or not an individual is employed. They do not show salaries, nor do they show whether individuals are employed full-time or part-time. That said, even this relatively simple barometer shows substantial differences between individuals with little education and those with academic degrees. An academic education is associated with substantially higher employment rates for Israelis of all backgrounds and ages. In addition to the equalizing effect that greater education has on employment rates across sectors and gender in Israel, it also has a very positive effect on the economic growth of the country as a whole by increasing the national ability to assimilate, utilize and develop new technologies requiring a more educated labor force in high-tech sectors.